Posthumous releases can be a strange business. Particularly with artists of Coltrane's stature, there seems to be an aim on the part of the record companies to milk as much as possible out of the back catalogue - there's not going to be any new music, after all. So various compilations of outtakes and unreleased 'gems' appear. Most of these, it has to be said, are rubbish. But every once in a while a collection of outtakes shines as bright as the material released at the time. This is one such collection. Put together in the late 1960s by Bob Thiele, (with it's final track added to the CD release by Ravi Coltrane many years later)this LP collects material from sessions in June 1965. 1965 was a fertile year for Coltrane, as he pushed and pushed at the boundaries of jazz convention. His releases from that year range from the conventional (but brilliant) 'A Love Supreme' to arguably the defining album of free jazz, 'Ascension'. The change in style evident between these two classic albums didn't happen overnight, and 'Living Space' goes some way towards documenting the shift in 'Trane's sound. There are moments of pure freedom evident here. This is particularly marked on 'Untitled 90320' where the rhythm section also play free, allowing Trane to push harder than anywhere else on the album. Although the piece is harmonically free, though, there's a definite rhythm here. My father (a big jazz fan but, as a drummer, allergic to free time) summed it up well a few years ago when he said "this is as much as I can cope with". Trane's playing elsewhere on the album is outstanding. 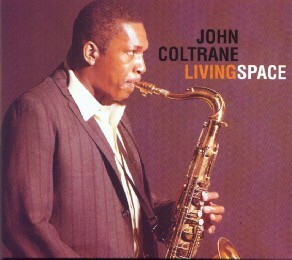 The title track is simply beautiful, Trane on soprano sounding as smooth as he could when he put his mind to it. The opening and closing themes of this track are rather special too - Trane overdubbed a second soprano track, playing slightly out of time and key to his first attempt, creating a haunting, melancholic sound. The album marks a couple of lasts in Coltrane's career. It's the last time he used the soprano on a studio recording, allegedly; and with 'The Last Blues' is the last time he recorded... well, a blues. It's actually nothing special and feels a bit tacked on to Thiele's well-considered tracklisting, but it's good to have nonetheless.